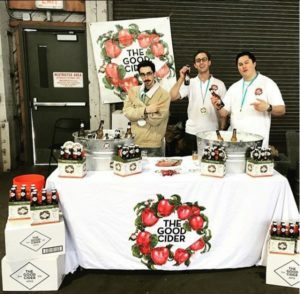 SpeedPro in San Francisco’s East Bay provides an assortment of signage from banners and tradeshow graphics to wall murals and vehicle wraps. Every project is tailored specifically to the clients’ needs and goals where no one project is the same. Our process begins with understanding what the client is looking for by going through a series of questions such as indoor vs. outdoor, long term vs. short term, etc. We take the time to work with our client through each step of the printing process to ensure that the end result exceeds their expectations. 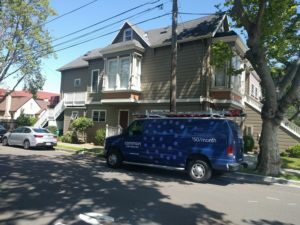 Our attention to detail and this in-depth process that we go through gives us great satisfaction when we see the finished product whether driving around town or at an event. Now he walks around town taking pictures of signs and vehicle graphics that he’s created to share with all of you. Because of that, we’ve created this page so that the next time you see a sign or graphic that we’ve done when you’re out and about, you can get as excited as we do! 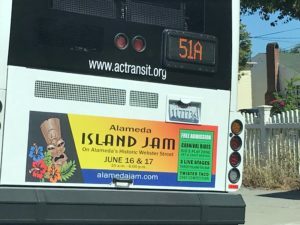 Island Jam Bus Graphics: We printed about 30 of these advertisements to be placed on AC Transit buses in efforts to market the Island Jam. After print production, we weren’t quite sure where we would run into these at but they were all around! 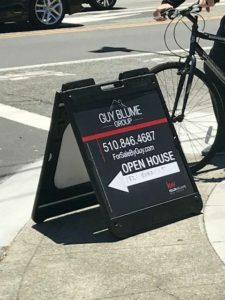 Real Estate Signs: When we print real-estate signs in-house they look like ordinary square plastic signs. But, when they’re up and installed on a lawn or on a corner they’re so much nicer to look at. Keller Williams is a big customer of ours with over 100 agents and growing. 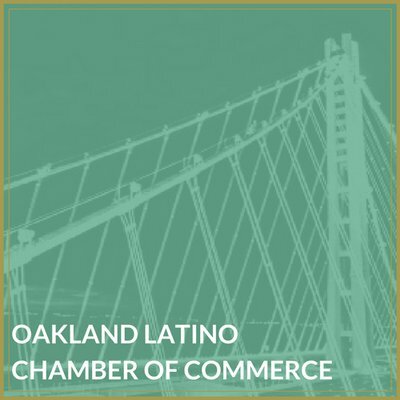 They have plans to open an Alameda office. 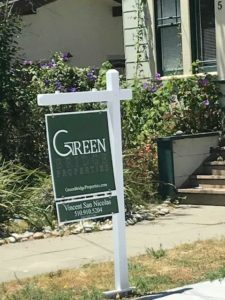 Green Bridge Properties is owned by Vince San Nicholas and also a good friend of SpeedPro East Bay. 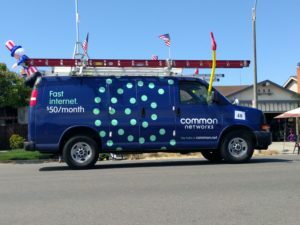 Common Networks Vans: They are a great customer and internet provider. We’ve wrapped a total of 6 of these vans all in different colors. Each of them came in at different times but now they’re all around Alameda and the South Bay. 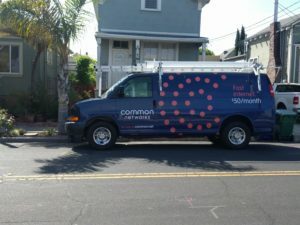 It’s always fun to see these parked in front of their clients’ homes and businesses, installing their internet service. Alameda Arts: Kate and Hazel at Alameda Arts are longtime friends of Ed and another great Alameda business with a focus on giving back and educating children in a fun way. 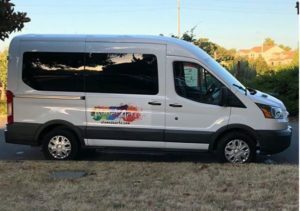 This vehicle is used for their week-long summer camp that takes them all around the Bay Area.